Welcome to the home page of Atmospheric Research & Technology, LLC (ART). We specialize in the development, manufacture, sales and servicing of Doppler sonic detection and ranging (sodar) systems. Our mission is to become the leading provider of high-quality, high-performance Doppler sodar systems and service and to ensure that every customer and client is fully satisfied with our products and services. ART is headquartered in Kailua-Kona, Hawaii, USA with manufacturing facilities in Chicago, Illinois, USA. The company was established in 2000 with the express purpose of providing equipment and service for acoustic remote sensing of the atmopshere. ART's president and principal, Mr. Barry D. Neal, has been qualified by the American Meteorological Society as a Certified Consulting Meteorologist. He has more than 35 years experience in performing and managing meteorological monitoring projects, including both sodar systems and tall-tower platforms. 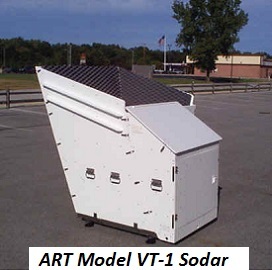 ART is committed to demonstrating the feasibility, cost-effectiveness, reliablity and accuracy of sodar technology for remote sensing of the lower layer of the atmosphere. Copyright © 2017 ART, LLC. All Rights Reserved.